Lansing lobbyist and businessman Gregory Eaton is one of very few people who have attended all 52 Super Bowls and plans to be in Georgia for Sunday’s 53rd. It’s the third time the Peach State has hosted the NFL’s big game, and since Detroit and Atlanta are hub cities for Delta Airlines, the area is very accessible to Michiganders. Beverly Berardo grew up near Grand Rapids in Grandville, Michigan, and earned a degree at Ferris State University before she took her talents south to become director of marketing at Reynolds Lake Oconee, one of the nation’s premier lakefront communities and golf destinations outside Atlanta. Berardo had been hoping the Lions would have won their way into the Atlanta Super Bowl, but the closest connection is Randy Haight, of Higgins Lake, who worked with the now late Terry Barr. Barr played receiver on the 1957 Detroit Lions that won the NFL Championship (before there even was a Super Bowl) and Haight now lives at Reynolds Lake Oconee. Barr was an All-American for the Wolverines in college; former Michigan football coach Rich Rodriguez has a home at Reynolds. Another Midwesterner with football experience, Mike Scully, moved down from Chicago to serve as General Manager and oversee the Reynolds Lake Oconee’s six scenic golf courses. 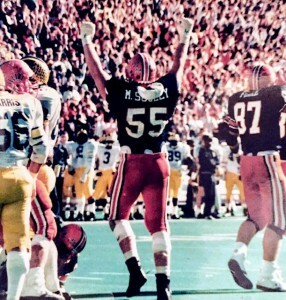 Scully’s 1983 University of Illinois football team beat both the Spartans and Wolverines on the way to a Big 10 Championship and a Rose Bowl berth. “Coming from Chicago to Georgia I had to trade pizza pie for pecan pie. But the people here have made me feel at home with Southern hospitality,” said Scully. He then revealed that some of the friendly caddies at Reynolds also work at the very genteel Augusta National Golf Club, site of the Masters Tournament, which is 70 miles away. Michigan State junior golfer Allyson Geer-Park was recently invited to compete against 71 other players in the first-ever Augusta National Women’s Amateur this April. “It’s the dream of any golfer to be on the grounds of Augusta. Seeing her name on the beautiful green invitation was very cool,” said MSU’s award-winning golf coach Stacy Slobodnik-Stoll, who says she will now finally get to see the course herself. Sue Parr is another Lansing to Georgia transplant. The past VP of the Lansing Regional Chamber of Commerce is now President of the Augusta Chamber. Augusta is home to golf’s most prestigious event, and Jack Nicklaus, who won a record six Masters Tournaments, designed the Great Waters Course at Reynolds Lake Oconee, where the terrain and feel of the land and trees are very similar to Augusta. The resort’s executive chef Derin Moore previously cooked at Bay Harbor Yacht Club in Petoskey, Michigan, and the famed Golden Mushroom in Southfield, a celebrity hangout which closed a number of years ago. “I still serve the ‘Golden Mushroom Soup,’ the original recipe, at The Tavern here. It was a staple for 30 plus years, and now you can get it here.” said Moore. Reynolds Lake Oconee features, in addition to golf, a 19,000-acre lake, trails, fitness, tennis culinary events, sophisticated lodging options, and a Ritz Carlton hotel. Visit www.ReynoldsLakeOconee.com.